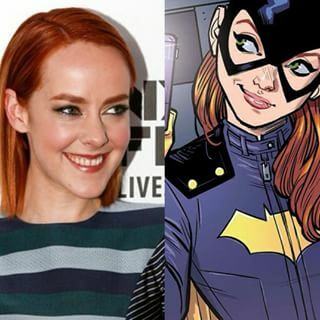 Is Jena Malone Batgirl in ‘Batman v Superman’? Rumors have been swirling that Jena Malone will be appearing in next year’s Batman v Superman: Dawn of Justice at least since last October, when The Hollywood Reporter “confirmed” her participation in the movie. Thing is, everyone has been assuming that she would play Carrie Kelley, the female version of Robin from Frank Miller‘s The Dark Knight Returns, the source material for this movie. Sure, Carrie was 13 years old in the graphic novel and Jena is 30, but the character can easily be aged into her 20s, and Jena can play much younger. Bolstering the Robin assumption was the fact that Jena dyed her hair bright red, like Carrie’s. However, Someone at Latino Review claims to have three sources confirming that Jena will instead be playing another DC Universe redhead, Barbara Gordon — but it is unknown which of Barbara’s two alter egos she will be: Batgirl or Oracle. Batgirl is, of course, a distaff version of Batman, and Jena surely has the ability to play a physical character — just take a look at her Johanna Mason in The Hunger Games: Catching Fire. But Oracle was the identity Barbara took on after she was shot and crippled by the Joker. Oracle is an information broker who uses a wheelchair. At this point, the only thing that is certain is that Jena was spotted on the Chicago set earlier this year, and even took photos with director Zack Snyder and fans. She claimed she was just visiting her Sucker Punch director, but who knows? This entry was posted in Actors/Actresses, Casting, Comic Book Movies, Film, Superheroes and tagged Barbara Gordon, Batgirl, Batman v Superman: Dawn of Justice, Carrie Kelley, Jena Malone, Oracle, Zack Snyder. Bookmark the permalink.